A tribute to the phenomenal company dancers and a reflection of the outstanding line-up of choreographers. Cincinnati Ballet Dancers in "Plays Well Together"
Cincinnati Ballet leaped into its new season with. “The Kaplan New Works Series,” continuing their tradition of contemporary ballet performances that are anything but traditional. Pushing the boundaries of innovation and recognizing no limits on what the human body can achieve, this year’s show is a tribute to the phenomenal company dancers and a reflection of the outstanding line-up of choreographers. Showcasing their remarkable talent on and off stage, two company dancers kick off what will surely be outstanding careers in choreography. Delivering four world premieres and one regional premiere, artistic director Victoria Morgan encourages the audience to “buckle up” for an emotional journey celebrating the strength and beauty of humanity. 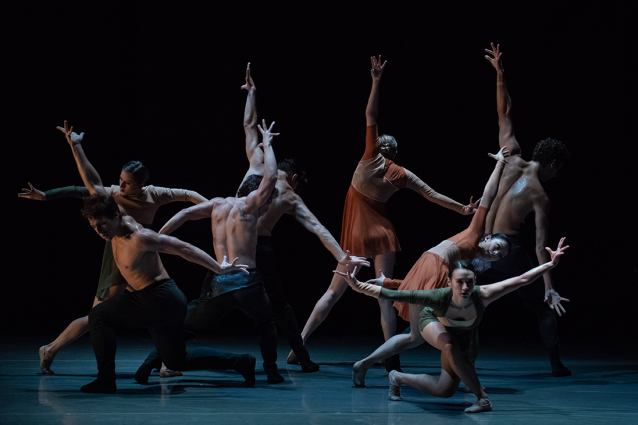 Marking the beginning of what always proves to be an extraordinary Cincinnati Ballet 2018-2019 Season, “New Works” sets the tone for a rite of passage for us all as we experience the creative genius of those who drive the movement and the unbelievable talent of those who deliver it. The performances speak for themselves, but here is a quick sneak peak to entice you just a little more to experience it for yourself. Choreographed by Cincinnati Ballet corps de ballet dancer, Taylor Carrasco. This is a delightful opener that leaves you smiling throughout at the infectious energy and cleverly choreographed dancing. 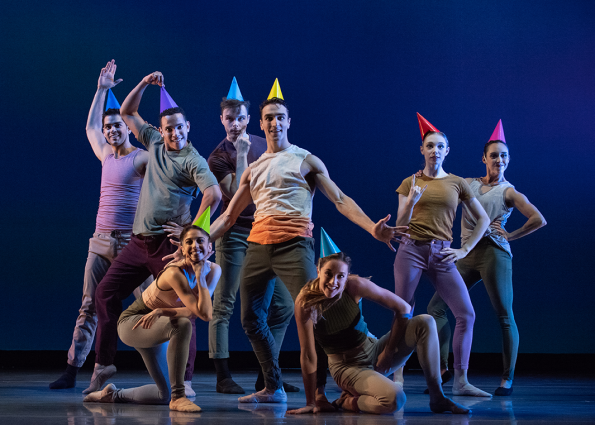 Reminiscent of Cirque du Soleil, this performance leverages an ensemble of dancers whose joy of dancing shines through every move, and a choreographer with an excellent sense of timing and quirk. Choreographed by Emmy-award winning Mia Michaels from “So You Think You Can Dance.” An emotionally charged performance danced beautifully by Maizyalet Velazquez and James Cunningham. For those of us familiar with Michaels, this reminded us why we fell in love with her in the early seasons of the popular FOX show. She has an extraordinary ability to couple beautiful music with strong dancers, taking the audience’s heart for a ride. 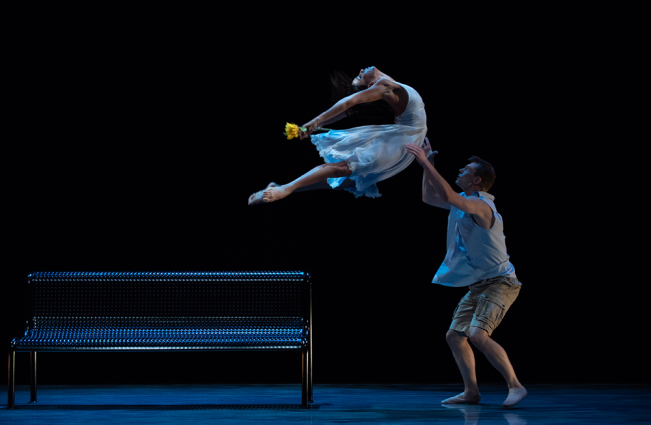 Cincinnati Ballet resident choreographer, Jennifer Archibald’s a tribute to the sheer, raw talent of five of the Company’s powerhouse male dancers. This piece alone is reason enough to attend the show, as the mesmerizing performance will leave you in awe and in true appreciation for both the vision and execution. Choreographed by Cincinnati Ballet soloist, David Morse. A drama-filled performance leveraging clever set design to highlight the connectivity among the dancers. Showcasing powerful pairings, including Christina LaForgia Morse and Taylor Carrasco, this piece brings to life how all of us are connected. Choreographed by San Francisco Ballet soloist, Myles Thatcher, brings the evening to a close with a thrilling performance that just continues to put the prowess of these dancers on display. Leading an incredibly deep bench of Company dancers, all four principle dancers (Melissa Gelfin, Sirui Liu, Chisako Ogo, and Cervilio Miguel Amador) make full use of the stage to show us what the human body can truly achieve when coupled with an exceptional artistic vision. “The Kaplan New Works Series” lasts from September 13-23 at the Aronoff’s Jarson-Kaplan Theater. Appropriate for anyone with an appreciation for dance and an open mind to this inventive form of ballet, please take the time to experience this utterly beautiful and powerful art form. In a world where we all need a few more time outs and opportunities to connect with one another, “New Works” provides the perfect venue. Keep in mind that this is only the beginning of the Cincinnati Ballet 2018-2019 Season, filled with our favorite fairy tales (“Peter Pan,” “The Sleeping Beauty” and “Aladdin”), anticipated favorites (“The Nutcracker,” “Bold Moves”) and a powerful classic (“Director’s Cut: Firebird + Rite of Spring”). Christi Geary is the proud mom of two girls (8 and 11), best friend and wife of her husband Brian, and an Associate Director at the Procter & Gamble Company focused on shopper innovation insights and analytics. She enjoys and participates in art of every kind, feeds an insatiable curiosity for learning every day through books and connecting with others, pursues different forms of exercise when she can find the time to balance out her foodie predilection (highly recommend DanceFix and Pilates Reformer), and delights in spending time with family and friends. Writing reviews for the arts is an absolute privilege and one she cherishes every day, with the hope that sharing her perspective will inspire others to embrace the arts. ArtsWave is the Greater Cincinnati region's local arts agency and the nation's largest community campaign for the arts. We believe that the arts— music, dance, theatre, museums, festivals, and more —create a vibrant regional economy and a more connected community. Cincy Arts + STEM is a joint project of ArtsWave, the Greater Cincinnati STEM Collaborative, and the Greater Cincinnati Alliance for Arts Education. Cincy Arts + STEM connects teachers, parents and youth in our community to programs that fuel creativity and learning.